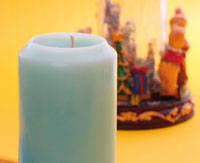 Learn how to make aromatherapy and decorative candles. up or creating a cozy atmosphere in any room. And with the number of styles and varieties you can make, these products are always in season. Ingredients can be purchased in a craft, hobby, or grocery store. Dyes and scents can also be bought from chemical retailers. 1. Place all your equipment in a large and open area, preferably near your kitchen or heating source so the wax stays hot before pouring. Line the workspace with old newspapers. This makes clean up easier and faster.